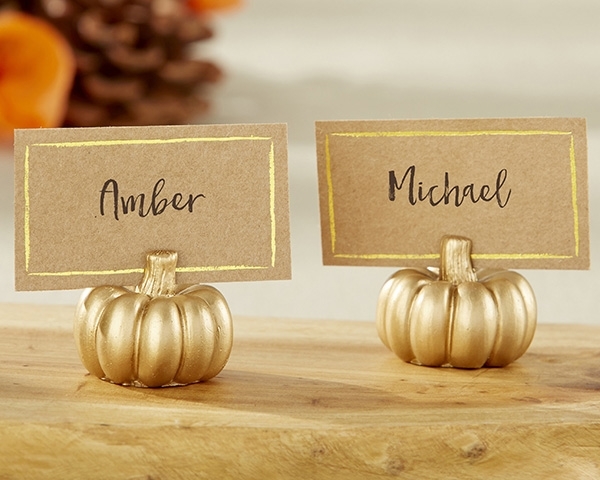 Dimensions: Holder: 1 3/16" x 1 2/5" diameter; Place card: 1 2/5" x 2 3/8"
Crafted from gold-colored resin, these golden pumpkin place card holders are perfect for a Fall-themed wedding or other celebration. Each comes with a coordinating blank Kraft-colored place card with gold foil bordering. PLEASE NOTE: The pictured coordinating place cards are included. Sold in sets of six (6) and prices quoted below are per set.